After Acer , LG ,HCL and many others , Sony is now into Indian netbook market with the new Sony VAIO W Series .The steeply developing internet community and decreasing price of internet enabled laptops aka netbooks might have made Sony to rethink about the necessity of low cost netbook for India and other parts of the world . 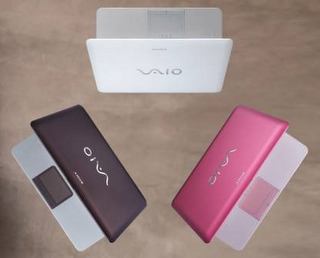 Just like other in Vaio series ,Sony VAIO W netbooks are excellent in external looks .Its available in three colors Sugar white ,Cocoa brown Band berry pink .Sony VAIO W Series netbook configuration includes variants of Intel Atom N280 processor at 1.66GHz , 10 inch LED backlit display ,1GB RAM ,160GB hard disk and pre-installed Windows XP professional. Features like integrated webcam ,WiFi and Bluetooth are also available . VAIO W Series netbooks will be with 10.1 inch LED-backlit display which offers 16:9 aspect ratio on maximum 1366 x 768-resolution . Built in webcam with microphone . Intel Atom N280 processor at 1.66GHz with 512 mb cache . 1GB RAM expandable upto 2GB. 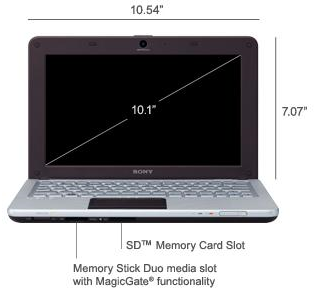 Networking applications in VAIO Multimedia Suite enables the Synchronization with PSP ,PC ,Digital camera other notebooks on home network share or stream music and other media . WiFi ,Bluetooth withA2Dp and 2 high speed USB ports for data transfer . Sony VAIO W netbook is now available across all Sony retailers across the country for a price tag of 27000-30000 ( 499-580 USD) ,which would vary on basis of processor , RAM and other configurations .